“You don’t fetch your kids – ‘Fetch’ is what your dog does when you throw him a stick,” says Heather Hansen, much to the amusement of the 60 participants at a seminar held by STJobs on Monday, 30 July 2012. 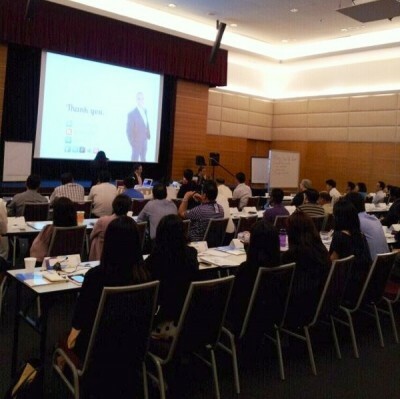 An advocate of speaking English well, Heather Hansen was at the seminar with other professional speakers, namely David Lim, Tom Abbott and Karen Leong, to impart presentation skills to help participants succeed at the workplace. Through various activities and discussions, participants learnt the power of networking, how they can negotiate better, be more aware of the way they speak so as to be better understood and give presentations that will ‘sell’. Karen, a certified influential communication speaker and coach, cannot stress enough the importance of making a good first impression. “It doesn’t matter where you are, or what the occasion is, you should always dress as the person you want to be – you usually only have seven seconds to capture someone’s attention when you meet them for the first time,” she says. Mr Andre van Straten, a political counsellor with the South African High Commission in Singapore, finds the seminar very useful. “In my line, I am often required to showcase South Africa to various business organisations to well-informed professionals. Through this seminar, I have picked up valuable lessons I can use the next time when I need to do a presentation to a sophisticated audience,” says the 49-year-old. Mr George Yu, 24, is another happy participant. “I find this seminar very helpful, as I have to deal with international prospects in my job often. Being Singaporean, we sometimes forget that the ‘Singaporean English’ we use can be quite different from the English used globally,” says the IT account executive. Coming up next month, learn how you can equip yourself with effective leadership and customer service skills. Register with STJobs today for early bird prices!